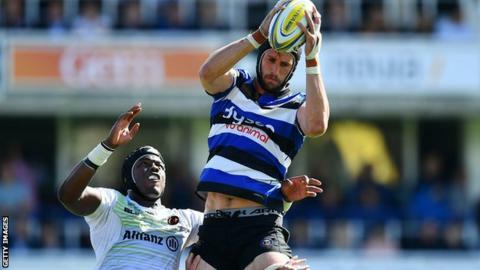 New Welsh Rugby Union (WRU) rules on eligibility to play for Wales will put some players in a tough position, says Bath's Wales second row Luke Charteris. Any player taking up a new deal with a team outside Wales in future must have won 60 caps to be eligible for Wales. Charteris, 34, left Welsh region The Dragons in 2012 under different WRU rules, with less than 60 caps, and joined Premiership club Bath in 2016. "It probably is a fairer way than the old system," he told BBC Radio Bristol. "Boys are going to be put in a tough position. I can understand why it's been done, because you need to keep players playing in Wales. "I was one of the lucky ones. I got that opportunity [to leave Wales]." Asked how it would have affected his decision if the new rules had been in place prior to his Dragons departure, Charteris said: "It would have been really tough. "Playing for Wales is the highest honour. If that rule was put in place before I left, then I probably would have stayed. "But I think that would have had a negative impact on my life and on my rugby, so I'm glad it wasn't around." Toulon-bound Wales scrum-half Rhys Webb will be ineligible to play for Wales next season under the new rule. Meanwhile, Exeter head coach Ali Hepher says Welsh players may decide to opt out of representing Wales to stay in England. "Some people think international rugby's the big thing, [but] some people might think 'actually for my development I'm better playing in this competition'," he told BBC Sport. The ruling would affect Chiefs prop Tomas Francis, whose contract ends in 2019. He has won 23 caps for Wales since making his debut in 2015. Cardiff Blues attempted to buy Francis, 25, earlier in 2017, but failed with their bid. "As a club we haven't really discussed it too much, so I don't know exactly where we would stand," Hepher said. "It'll very much be on an individual basis and we'll see what comes of it. "We can't predict what'll happen in the future so, we'll see what happens and make decisions that are right for the club, and individuals will make those calls on recruitment as well."